Trump also took aim at the report’s disclosure of text messages from two FBI agents that Republicans say are evidence of FBI bias against the president. 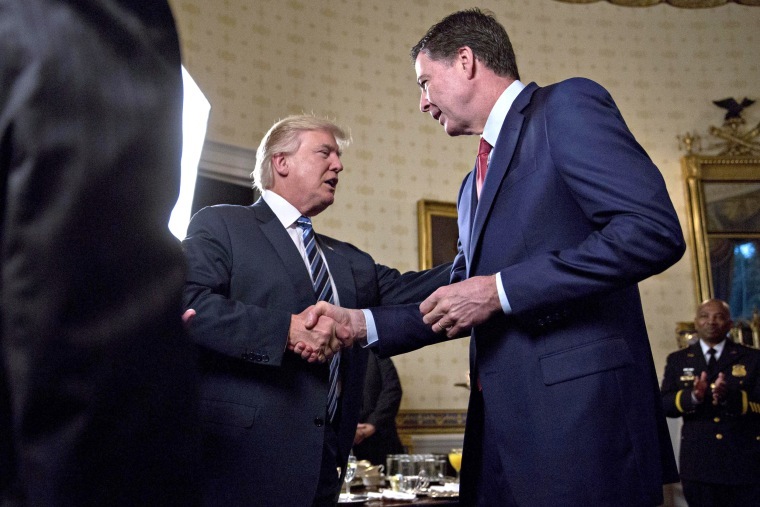 President Donald Trump on Thursday called the just-released report by the Justice Department’s inspector general a "total disaster for James Comey" and his "minions" and defended his controversial decision to fire the former FBI director last year. "The IG Report is a total disaster for Comey, his minions and sadly, the FBI. Comey will now officially go down as the worst leader, by far, in the history of the FBI. I did a great service to the people in firing him," Trump posted. "Good Instincts. Christopher Wray will bring it proudly back!." Trump also took aim at the report’s disclosure of text messages from two FBI agents that Republicans have seized on as evidence of FBI bias against the president. "FBI Agent Peter Strzok, who headed the Clinton & Russia investigations, texted to his lover Lisa Page, in the IG Report, that "we’ll stop" candidate Trump from becoming President. Doesn’t get any lower than that!" Trump wrote. In an interview with "Fox and Friends" outside the White House later Friday morning, Trump said there was "total bias" at the FBI and that the "IG blew it" with its "horror show" report. When asked if Comey should be "locked up," Trump replied, "I would never want to get involved with that ... but what he did was criminal." The report released Thursday by the Justice Department's watchdog said that Comey breached protocol and was "insubordinate" but was not politically motivated in his handling of the Hillary Clinton email probe. Trump told reporters Friday, as he walked to his "Fox and Friends" interview that felt that "wasn't the correct opinion." "That was the most biased set of circumstances I’ve ever seen in my life. Honestly to read it was very sad," he said. The report also revealed that Comey used a personal email account to conduct unclassified FBI business, which was "inconsistent" with policy and revealed more controversial text messages between Strzok, and FBI agent, and Page, an FBI lawyer. "[Trump's] not ever going to become president, right? Right?!" Lisa Page, wrote Strzok. Prior to Trump’s tweets on the IG report, White House Press Secretary Sarah Sanders said Thursday that it had "reaffirmed the President's suspicions about Comey's conduct and the political bias among some of the members of the FBI." "I do not agree with all of the inspector general’s conclusions, but I respect the work of his office and salute its professionalism," he wrote.